All the news stories that stole the limelight today. 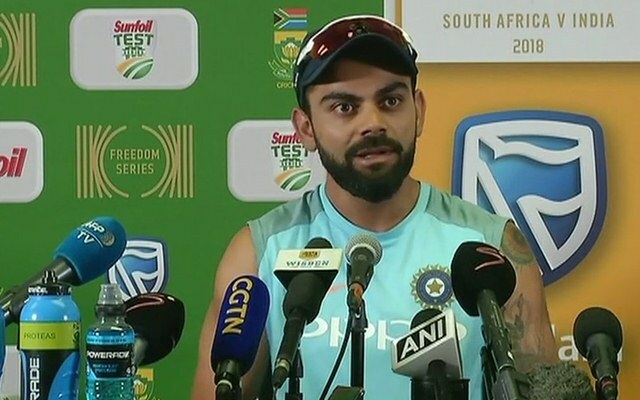 During the festive season in India, the cricket team’s skipper Virat Kohli invited a controversy over his comments on the fans liking the cricketers from the other countries. He suggested such people to leave India and the video of the same went viral in no time as many lashed out at Kohli for the same. Australian cricket is in complete turmoil this year. Their marquee players David Warner and Steve Smith along with Cameron Bancroft were found guilty of trying to change the condition of the ball and Cricket Australia (CA) took strict action on them. India are the two-time champions in the World Cup, having won the event in 1983 and 2011 respectively. Albeit they bowed out of the tournament last time around in 2015 after their defeat against home team Australia in the semi-finals, a lot would be expected of the Men in Blue in the upcoming edition of the 50-overs mega event. The left-arm pacer Jason Behrendorff has been included in the Australia squad to face South Africa in the one-off T20I match and the forthcoming three-match T20I series against India. The T20s would be missed by the likes of Mitchell Starc, Nathan Lyon, Peter Siddle, and Mitchell Marsh as Australia look to preserve their resources for the four-match Test series against India. Virat Kohli, the 30-year-old Indian captain, is a personality, who doesn’t prefer to hold himself back while sharing his opinions on various topics. He is undoubtedly one of the greatest cricketers India have ever produced, but questions surrounding his aggressive behaviour have often been raised. England fast bowler James Anderson has received an official reprimand and one demerit point for breaching the ICC Code of Conduct during the second day’s play in the first Test against Sri Lanka in Galle on Wednesday. Anderson was found to have violated Article 2.8 of the ICC Code of Conduct for Players and Player Support Personnel, which relates to “showing dissent at an umpire’s decision during an international match”. After a humiliating whitewash in the T20I series, New Zealand made a stupendous comeback with a 47-run win in the first ODI against Pakistan at Sheikh Zayed Stadium in Abu Dhabi. However, during the match, a shambolic incident took place. During the Black Caps’ innings, senior batsman Ross Taylor questioned off-break bowler Mohammad Hafeez’s bowling action. Usman Khawaja gave a major boost to the struggling Australian team ahead of their home Test series against India, which is scheduled to begin next month. Khawaja claimed his recovery from a meniscal tear, an injury which he suffered during the tour of UAE, is fractionally ahead of the schedule, thus brightening his chances to get fit and play against India in the first Test starts on December 6. The Sydney Thunder had a torrid time last time around in the Big Bash League (BBL). They finished the league stage with four wins from 10 matches and bowed out of the tournament before the knockouts. The league vs nation debate is back. This time though in a different way. The much-awaited World Cup will be commencing within 10 days after the conclusion of the Indian Premier League (IPL) and it is clear that every country will be wanting their best players to stay fit for the showpiece event. The Committee of Administrators (CoA) has fired back at Ravi Shastri for passing on the statement, “The present Indian team is the best travelling in the last 15 years”. While the Indian team has remained invincible over the years on their home paradise and within the subcontinent, however, they lose their aura when they go out to face teams outside Asia.